Borneo (/ˈbɔːrnioʊ/; Malay: Pulau Borneo, Indonesian: Kalimantan) is the third-largest island in the world and the largest in Asia. [note 1] At the geographic centre of Maritime Southeast Asia, in relation to major Indonesian islands, it is located north of Java, west of Sulawesi, and east of Sumatra. Chinese: (Bruneian, Malaysian, Indonesian) etc. The island is known by many names. Internationally it is known as Borneo, after Brunei, derived from European contact with the kingdom in the 16th century during the Age of Exploration. The name Brunei possibly derives from the Sanskrit word váruṇa (वरुण), meaning either "water" or Varuna, the Vedic god of rain. Indonesian natives called it Kalimantan, which was derived from the Sanskrit word Kalamanthana, meaning "burning weather island" (to describe its hot and humid tropical weather). In earlier times, the island was known by other names. In 977, Chinese records began to use the term Bo-ni to refer to Borneo. In 1225, it was also mentioned by the Chinese official Chau Ju-Kua (趙汝适). The Javanese manuscript Nagarakretagama, written by Majapahit court poet Mpu Prapanca in 1365, mentioned the island as Nusa Tanjungnagara, which means the island of the Tanjungpura Kingdom. Borneo is surrounded by the South China Sea to the north and northwest, the Sulu Sea to the northeast, the Celebes Sea and the Makassar Strait to the east, and the Java Sea and Karimata Strait to the south. To the west of Borneo are the Malay Peninsula and Sumatra. To the south and east are islands of Indonesia: Java and Sulawesi, respectively. To the northeast are the Philippine Islands. With an area of 743,330 square kilometres (287,000 sq mi), it is the third-largest island in the world, and is the largest island of Asia (the largest continent). Its highest point is Mount Kinabalu in Sabah, Malaysia, with an elevation of 4,095 m (13,435 ft). Before sea levels rose at the end of the last Ice Age, Borneo was part of the mainland of Asia, forming, with Java and Sumatra, the upland regions of a peninsula that extended east from present day Indochina. The South China Sea and Gulf of Thailand now submerge the former low-lying areas of the peninsula. Deeper waters separating Borneo from neighbouring Sulawesi prevented a land connection to that island, creating the divide known as Wallace's Line between Asian and Australia-New Guinea biological regions. Kapuas River in Indonesia; at 1,000 km (620 mi) in length, it is the longest river in Borneo. 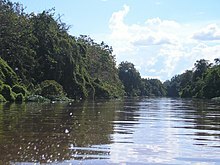 The largest river system is the Kapuas in West Kalimantan, with a length of 1,000 km (620 mi). Other major rivers include the Mahakam in East Kalimantan (920 km long (570 mi)), the Barito in South Kalimantan (900 km long (560 mi)), Rajang in Sarawak (565 km long (351 mi)) and Kinabatangan in Sabah (560 km long (350 mi)). Borneo has significant cave systems. In Sarawak, the Clearwater Cave has one of the world's longest underground rivers while Deer Cave is home to over three million bats, with guano accumulated to over 100 metres (330 ft) deep. The Gomantong Caves in Sabah has been dubbed as the "Cockroach Cave" due to the presence of millions of cockroaches inside the cave. The Gunung Mulu National Park in Sarawak and Sangkulirang-Mangkalihat Karst in East Kalimantan which particularly a karst areas contains thousands of smaller caves. The Borneo rainforest is estimated to be around 140 million years old, making it one of the oldest rainforests in the world. It is the centre of the evolution and distribution of many endemic species of plants and animals, and the rainforest is one of the few remaining natural habitats for the endangered Bornean orangutan. It is an important refuge for many endemic forest species, including the Borneo elephant, the eastern Sumatran rhinoceros, the Bornean clouded leopard, the hose's palm civet and the dayak fruit bat. Peat swamp forests occupy the entire coastline of Borneo. The soil of the peat swamp are comparatively infertile, while it is known to be the home of various bird species such as the hook-billed bulbul, helmeted hornbill and rhinoceros hornbill. There are about 15,000 species of flowering plants with 3,000 species of trees (267 species are dipterocarps), 221 species of terrestrial mammals and 420 species of resident birds in Borneo. There are about 440 freshwater fish species in Borneo (about the same as Sumatra and Java combined). The Borneo river shark is known only from the Kinabatangan River. In 2010, the World Wide Fund for Nature (WWF) stated that 123 species have been discovered in Borneo since the "Heart of Borneo" agreement was signed in 2007. 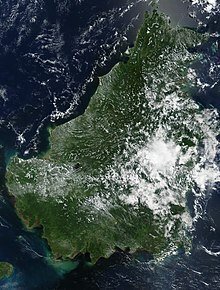 The Borneo montane rain forests lie in the central highlands of the island, above the 1,000 metres (3,300 ft) elevation. The Tropical and subtropical grasslands, savannas, and shrublands on South Kalimantan. The highest elevations of Mount Kinabalu are home to the Kinabalu mountain alpine meadow, an alpine shrubland notable for its numerous endemic species, including many orchids. 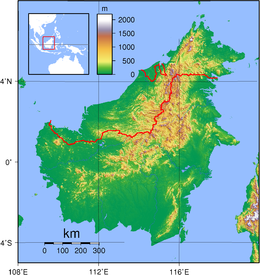 The island historically had extensive rainforest cover, but the area was reduced due to heavy logging by the Indonesian and Malaysian wood industry, especially with the large demands of raw materials from industrial countries along with the conversion of forest lands for large-scale agricultural purposes. Half of the annual global tropical timber acquisition comes from Borneo. 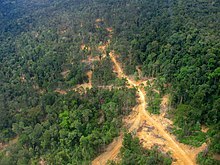 Palm oil plantations have been widely developed and are rapidly encroaching on the last remnants of primary rainforest. Forest fires since 1997, started by the locals to clear the forests for plantations were exacerbated by an exceptionally dry El Niño season, worsening the annual shrinkage of the rainforest. During these fires, hotspots were visible on satellite images and the resulting haze frequently affected Brunei, Indonesia and Malaysia. The haze could also reach southern Thailand, Cambodia, Vietnam and the Philippines as evidenced on the 2015 Southeast Asian haze. Dayak, the main indigenous people in the island, were feared for their headhunting practices. In November 2018, scientists reported the discovery of the oldest known figurative art painting, over 40,000 (perhaps as old as 52,000) years old, of an unknown animal, in the cave of Lubang Jeriji Saléh on the island of Borneo. According to ancient Chinese (977),:129 Indian and Japanese manuscripts, western coastal cities of Borneo had become trading ports by the first millennium AD. In Chinese manuscripts, gold, camphor, tortoise shells, hornbill ivory, rhinoceros horn, crane crest, beeswax, lakawood (a scented heartwood and root wood of a thick liana, Dalbergia parviflora), dragon's blood, rattan, edible bird's nests and various spices were described as among the most valuable items from Borneo. The Indians named Borneo Suvarnabhumi (the land of gold) and also Karpuradvipa (Camphor Island). The Javanese named Borneo Puradvipa, or Diamond Island. Archaeological findings in the Sarawak river delta reveal that the area was a thriving centre of trade between India and China from the 6th century until about 1300. Stone pillars bearing inscriptions in the Pallava script, found in Kutai along the Mahakam River in East Kalimantan and dating to around the second half of the 4th century, constitute some of the oldest evidence of Hindu influence in Southeast Asia. By the 14th century, Borneo became a vassal state of Majapahit (in present-day Indonesia), later changing its allegiance to the Ming dynasty of China. The religion of Islam entered the island in the 10th century, following the arrival of Muslim traders who later converted many indigenous peoples in the coastal areas. The Sultanate of Brunei declared independence from Majapahit following the death of Majapahit Emperor in mid-14th century. During its golden age under Bolkiah from the 15th century to the 17th century, the Bruneian Empire ruled almost the entire coastal area of Borneo (lending its name to the island due to its influence in the region) and several islands in the Philippines. During the 1450s, Shari'ful Hashem Syed Abu Bakr, an Arab born in Johor, arrived in Sulu from Malacca. In 1457, he founded the Sultanate of Sulu; he titled himself as "Paduka Maulana Mahasari Sharif Sultan Hashem Abu Bakr". Following their independence in 1578 from Brunei's influence, the Sulu's began to expand their thalassocracy to parts of the northern Borneo. Both the sultanates who ruled northern Borneo had traditionally engaged in trade with China by means of the frequently-arriving Chinese junks. Despite the thalassocracy of the sultanates, Borneo's interior region remained free from the rule of any kingdoms. Since the fall of Malacca in 1511, Portuguese merchants traded regularly with Borneo, and especially with Brunei from 1530. Having visited Brunei's capital, the Portuguese described the place as surrounded by a stone wall. While Borneo was seen as rich, the Portuguese did not make any attempts to conquer it. The Spanish visit to Brunei led to the Castilian War in 1578. The English began to trade with Sambas of southern Borneo in 1609, while the Dutch only began their trade in 1644: to Banjar and Martapura, also in the southern Borneo. The Dutch tried to settle the island of Balambangan, north of Borneo, in the second half of the 18th century, but withdrew by 1797. In 1812, the sultan in southern Borneo ceded his forts to the English East India Company. The English, led by Stamford Raffles, then tried to establish an intervention in Sambas but failed. Although they managed to defeat the Sultanate the next year and declared a blockade on all ports in Borneo except Brunei, Banjarmasin and Pontianak, the project was cancelled by the British Governor-General Lord Minto in India as it was too expensive. At the beginning of British and Dutch exploration on the island, they described the island of Borneo as full of head hunters, with the indigenous in the interior practising cannibalism, and the waters around the island infested with pirates, especially between the north eastern Borneo and the southern Philippines. The Malay and Sea Dayak pirates preyed on maritime shipping in the waters between Singapore and Hong Kong from their haven in Borneo, along with the attacks by Illanuns of the Moro Pirates from the southern Philippines, such as in the Battle off Mukah. Map of the island divided between the British and the Dutch, 1898. 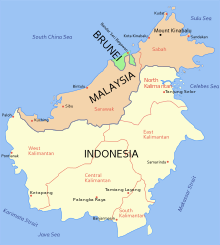 The present boundaries of Malaysia, Indonesia and Brunei are largely inherited from the British and Dutch colonial rules. The Dutch began to intervene in the southern part of the island upon resuming contact in 1815, posting Residents to Banjarmasin, Pontianak and Sambas and Assistant-Residents to Landak and Mampawa. The Sultanate of Brunei in 1842 granted large parts of land in Sarawak to the English adventurer James Brooke, as a reward for his help in quelling a local rebellion. Brooke established the Kingdom of Sarawak and was recognised as its rajah after paying a fee to the Sultanate. He established a monarchy, and the Brooke dynasty (through his nephew and great-nephew) ruled Sarawak for 100 years; the leaders were known as the White Rajahs. 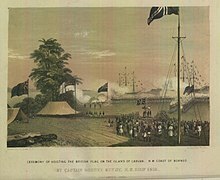 Brooke also acquired the island of Labuan for Britain in 1846 through the Treaty of Labuan with the Sultan of Brunei, Omar Ali Saifuddin II on 18 December 1846. The region of northern Borneo came under the administration of North Borneo Chartered Company following the acquisition of territory from the Sultanates of Brunei and Sulu by a German businessman and adventurer named Baron von Overbeck, before it was passed to British Dent brothers (comprising Alfred Dent and Edward Dent). Further enroachment by the British reduced the territory of Brunei. This led the 26th Sultan of Brunei, Hashim Jalilul Alam Aqamaddin to appeal the British to stop, and as a result a Treaty of Protection was signed in 1888, rendering Brunei a British protectorate. Before the acquisition by the British, the Americans also managed to establish their temporary presence in northwestern Borneo after acquiring a parcel of land from the Sultanate of Brunei. A company known as American Trading Company of Borneo was formed by Joseph William Torrey, Thomas Bradley Harris and several Chinese investors, establishing a colony named "Ellena" in the Kimanis area. The colony failed and was abandoned, due to denials of financial backing, especially by the US government, and to diseases and riots among the workers. Before Torrey left, he managed to sell the land to the German businessman, Overbeck. Meanwhile, the Germans under William Frederick Schuck were awarded a parcel of land in northeastern Borneo of the Sandakan Bay from the Sultanate of Sulu where he conducted business and exported large quantities of arms, opium, textiles and tobacco to Sulu before the land was also passed to Overbeck by the Sultanate. Prior to the recognition of Spanish presence in the Philippine archipelago, a protocol known as the Madrid Protocol of 1885 was signed between the governments of the United Kingdom, Germany and Spain in Madrid to cement Spanish influence and recognise their sovereignty over the Sultanate of Sulu—in return for Spain's relinquishing its claim to the former possessions of the Sultanate in northern Borneo. The British administration then established the first railway network in northern Borneo, known as the North Borneo Railway. During this time, the British sponsored a large number of Chinese workers to migrate to northern Borneo to work in European plantation and mines, and the Dutch followed suit to increase their economic production. By 1888, North Borneo, Sarawak and Brunei in northern Borneo had become British protectorate. The area in southern Borneo was made Dutch protectorate in 1891. The Dutch who already claimed the whole Borneo were asked by Britain to delimit their boundaries between the two colonial territories to avoid further conflicts. The British and Dutch governments had signed the Anglo-Dutch Treaty of 1824 to exchange trading ports in Malay Peninsula and Sumatra that were under their controls and assert spheres of influence. This resulted in indirectly establishing British- and Dutch-controlled areas in the north (Malay Peninsula) and south (Sumatra and Riau Islands) respectively. During World War II, Japanese forces gained control and occupied most areas of Borneo from 1941–45. 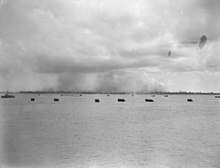 In the first stage of the war, the British saw the Japanese advance to Borneo as motivated by political and territorial ambitions rather than economic factors. The occupation drove many people in the coastal towns to the interior, searching for food and escaping the Japanese. The Chinese residents in Borneo, especially with the Sino-Japanese War in Mainland China mostly resisted the Japanese occupation. Following the formation of resistance movements in northern Borneo such as the Jesselton Revolt, many innocent indigenous and Chinese people were executed by the Japanese for their alleged involvement. In Kalimantan, the Japanese also killed many Malay intellectuals, executing all the Malay Sultans of West Kalimantan in the Pontianak incidents, together with Chinese people who were already against the Japanese for suspecting them to be threats. Sultan Muhammad Ibrahim Shafi ud-din II of Sambas was executed in 1944. The Sultanate was thereafter suspended and replaced by a Japanese council. The Japanese also set-up Pusat Tenaga Rakjat (PUTERA) in the Indonesian archipelago in 1943, although it was abolished the following year when it become too nationalistic. Some of the Indonesian nationalist like Sukarno and Hatta who had returned from Dutch exile began to co-operate with the Japanese. Shortly after his release, Sukarno became President of the Central Advisory Council, an advisory council for south Borneo, Celebes, and Lesser Sunda, set up in February 1945. Since the fall of Singapore, the Japanese sent several thousand of British and Australian prisoners of war to camps in Borneo such as Batu Lintang camp. From the Sandakan camp site, only six of some 2,500 prisoners survived after they were forced to march in an event known as the Sandakan Death March. In addition, of the total of 17,488 Javanese labourers brought in by the Japanese during the occupation, only 1,500 survived mainly due to starvation, harsh working conditions and maltreatment. The Dayak and other indigenous people played a role in guerrilla warfare against the occupying forces, particularly in the Kapit Division. They temporarily revived headhunting of Japanese toward the end of the war, with Allied Z Special Unit provided assistance to them. Australia contributed significantly to the liberation of Borneo. The Australian Imperial Force was sent to Borneo to fight off the Japanese. Together with other Allies, the island was completely liberated in 1945. Towards the end of the war, Japan decided to give an early independence to a new proposed country of Indonesia on 17 July 1945, with an Independence Committee meeting scheduled for 19 August 1945. However, following the surrender of Japan to the Allied forces, the meeting was shelved. Sukarno and Hatta continued the plan by unilaterally declaring independence, although the Dutch tried to retake their colonial possession in Borneo. The southern part of the island achieved its independence through the Proclamation of Indonesian Independence on 17 August 1945. The reaction was relatively muted with little open fighting in Pontianak or in the Chinese majority areas. While nationalist guerrillas supporting the inclusion of southern Borneo in the new Indonesian republic were active in Ketapang, and to lesser extent in Sambas where they rallied with the red-white flag which became the flag of Indonesia, most of the Chinese residents in southern Borneo expected to be liberate by Chinese Nationalist troops from Mainland China and to integrate their districts as an overseas province of China. In May 1945, officials in Tokyo suggested that whether northern Borneo should be included in the proposed new country of Indonesia should be separately determined based on the desires of its indigenous people and following the disposition of Malaya. Sukarno and Mohammad Yamin meanwhile continuously advocated for a Greater Indonesian republic. As the President of the new republic, perceiving the British trying to maintain their presence in northern Borneo and Malay Peninsula, he decided to launch a military infiltration later known as the confrontation from 1962 to 1969. In 1961, Prime Minister Tunku Abdul Rahman of the independent Federation of Malaya desired to unite Malaya, the British colonies of Sarawak, North Borneo, Singapore and the Protectorate of Brunei under the proposed Federation of Malaysia. The idea was heavily opposed by the governments in both Indonesia and the Philippines as well from Communist sympathisers and nationalists in Borneo. As a response to the growing opposition, the British deployed their armed forces to guard their colonies against Indonesian and communist revolts, which was also participated by Australia and New Zealand. The Philippines opposed the newly proposed federation, claiming the eastern part of North Borneo (today the Malaysian state of Sabah) as part of its territory as a former possession of the Sultanate of Sulu. The Philippine government mostly based their claim on the Sultanate of Sulu's cession agreement with the British North Borneo Company, as by now the Sultanate had come under the jurisdiction of the Philippine republican administration, which therefore should inherit the Sulu former territories. The Philippine government also claimed that the heirs of the Sultanate had ceded all their territorial rights to the republic. The Sultanate of Brunei at the first welcomed the proposal of a new larger federation. Meanwhile, the Brunei People's Party led by A.M. Azahari desired to reunify Brunei, Sarawak and North Borneo into one federation known as the North Borneo Federation (Malay: Kesatuan Negara Kalimantan Utara), where the Sultan of Brunei would be the head of state for the federation—though Azahari had his own intention to abolish the Brunei Monarchy, to make Brunei more democratic, and to integrate the territory and other former British colonies in Borneo into Indonesia, with the support from the latter government. This directly led to the Brunei Revolt, which thwarted Azahari's attempt and forced him to escape to Indonesia. Brunei withdrew from being part of the new Federation of Malaysia due to some disagreements on other issues while political leaders in Sarawak and North Borneo continued to favour inclusion in a larger federation. With the continuous opposition from Indonesia and the Philippines, the Cobbold Commission was established to discover the feeling of the native populations in northern Borneo; it found the people greatly in favour of federation, with various stipulations. The federation was successfully achieved with the inclusion of northern Borneo through the Malaysia Agreement on 16 September 1963. To this day, the area in northern Borneo is still subjected to attacks by Moro Pirates since the 18th century and militant from groups such as Abu Sayyaf since 2000 in the frequent cross border attacks. During the administration of Philippine President Ferdinand Marcos, the President made some attempts to destabilise the state of Sabah, although his plan failed and resulted in the Jabidah massacre and later the insurgency in the southern Philippines. The demonym for Borneo is Bornean. Borneo has 21.3 million inhabitants (in 2014), a population density of 29 inhabitants per square kilometre (75 inhabitants per square mile). Most of the population lives in coastal cities, although the hinterland has small towns and villages along the rivers. 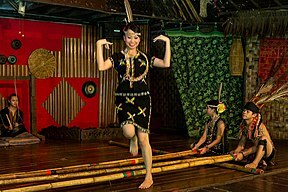 The population consists mainly of Dayak ethnic groups, Malay, Banjar, Orang Ulu, Chinese and Kadazan-Dusun. The Chinese, who make up 29% of the population of Sarawak and 17% of total population in West Kalimantan, Indonesia are descendants of immigrants primarily from southeastern China. In Sabah during the administration of Mustapha Harun of the United Sabah National Organisation (USNO) in the 1970s, thousands of Muslim immigrants and refugees from the southern Philippines of Mindanao and Sulawesi of Indonesia were given sanctuary and later identity cards in the bid to increase the Muslim population of the state: a policy later known as Project IC. Due to the high number of crimes attributed to the new migrant populations, ethnic tension between the indigenous and migrant populations has risen up to the present. In Kalimantan since the 1990s, the Indonesian government has undertaken an intense transmigration program; to that end it has financed the relocation of poor, landless families from Java, Madura, and Bali. By 2001, transmigrants made up 21% of the population in Central Kalimantan. Since the 1990s, the indigenous Dayak and Malays have resisted encroachment by these migrants, and violent conflict has occurred between some transmigrant and indigenous populations. In the 1999 Sambas riots, Dayaks and Malays joined together to massacre thousands of the Madurese migrants. In Kalimantan, thousands were killed in 2001 fighting between Madurese transmigrants and the Dayak people in the Sampit conflict. The following is a list of 20 largest cities in Borneo by population, based on 2010 census for Indonesia and 2010 census for Malaysia. Population data signifies number within official districts and does not include adjoining or nearby conurbation outside defined districts—such as Kota Kinabalu and Banjarbaru. In other instances, the district area is much larger than the actual city it represents thereby relatively inflating the population estimate by including the surrounding rural population—in cases such as Tawau and Palangka Raya. Borneo's economy depends mainly on agriculture, logging and mining, oil and gas, and ecotourism. Brunei's economy is highly dependent on the oil and gas production sector, and the country has become one of the largest oil producers in Southeast Asia. The Malaysian states of Sabah and Sarawak are both top exporters of timber. Sabah is also known as the agricultural producer of rubber, cacao, and vegetables, and for its fisheries, while both Sabah and Sarawak export liquefied natural gas (LNG) and petroleum. The Indonesian provinces of Kalimantan are mostly dependent on mining sectors despite also being involved in logging and oil and gas explorations. Some study about paddy planting of Sarawak was reported in. ^ See List of islands by area. ^ Donna Marchetti (2 August 1998). "Borneo's Wild Side". The New York Times. Retrieved 20 June 2017. ^ Eugene Linden (17 March 2011). The Ragged Edge of the World: Encounters at the Frontier Where Modernity, Wildlands and Indigenous Peoples Meet. Penguin Publishing Group. pp. 30–. ISBN 978-1-101-47613-0. ^ Siti Norkhalbi Haji Wahsalfelah (2005). "Traditional Woven Textiles: Tradition and Identity Construction in the 'New State' of Brunei Darussalam" (PDF). Universiti Brunei Darussalam. pp. 48/29. Retrieved 24 May 2017. ^ Suyatno. "Naskah Nagarakretagama" (in Indonesian). National Library of Indonesia. Archived from the original on 23 May 2017. Retrieved 13 October 2014. ^ a b "An Awesome Island". Borneo: Island in the Clouds. PBS. Retrieved 11 November 2012. ^ James Allan Taylor (1984). Biogeography: Recent Advances and Future Directions. Rowman & Littlefield. pp. 178–. ISBN 978-0-389-20507-4. ^ Teresa Zubi (25 October 2015). "Wallacea". Starfish. Archived from the original on 25 May 2017. Retrieved 26 May 2017. ^ a b Khee Giap Tan; Nurina Merdikawati; Mulya Amri; Blake Harley Berger (8 September 2015). 2014 Annual Competitiveness Analysis and Development Strategies for Indonesian Provinces. World Scientific. pp. 286–. ISBN 978-981-4730-43-3. ^ Tomas Tomascik (1997). The Ecology of the Indonesian Seas. Oxford University Press. pp. 54–. ISBN 978-0-19-850186-2. ^ Khee Giap Tan; Mulya Amri; Linda Low; Kong Yam Tan (2013). Competitiveness Analysis and Development Strategies for 33 Indonesian Provinces. World Scientific. pp. 338–. ISBN 978-981-4504-86-7. ^ Tropical River Fisheries Valuation: Background Papers to a Global Synthesis. WorldFish. 2008. pp. 218–. ISBN 978-983-2346-61-6. ^ Uwe Tietze; Food and Agriculture Organization of the United Nations (2007). Credit and Microfinance Needs in Inland Capture Fisheries Development and Conservation in Asia. Food & Agriculture Org. pp. 131–. ISBN 978-92-5-105756-8. ^ "Sarawak Visitors Guide". Sarawak State Government. p. 100. Retrieved 26 May 2017. ^ Nora Rappaport (29 October 2015). "WATCH: Billions of Bugs Feast on Flesh and Dung in Borneo". National Geographic. Retrieved 26 May 2017. ^ Sean Martin (31 October 2015). "Cockroach cave: Where billions of bugs feed on dead animals and dung [Video]". International Business Times (UK). Retrieved 26 May 2017. ^ Quentin Phillipps; Karen Phillipps (10 May 2016). Phillipps' Field Guide to the Mammals of Borneo and Their Ecology: Sabah, Sarawak, Brunei, and Kalimantan. Princeton University Press. pp. 31–. ISBN 978-0-691-16941-5. ^ Andy Leeder; Alan Brown; Gregg Coleman; Bob Digby; Glyn Owen; Val Davis (22 August 2016). WJEC GCSE Geography. Hodder Education. pp. 199–. ISBN 978-1-4718-6130-7. ^ "Scientists find dozens of new species in Borneo rainforests". World Wide Fund for Nature. 19 December 2006. Retrieved 26 May 2017. ^ "Borneo wildlife". World Wide Fund for Nature. Retrieved 26 May 2017. ^ Kathy MacKinnon; Gusti Hatta (5 February 2013). Ecology of Kalimantan: Indonesian Borneo. Tuttle Publishing. pp. 148–. ISBN 978-1-4629-0505-8. Fanny Lai; Bjorn Olesen (16 August 2016). Visual Celebration of Borneo's Wildlife. Tuttle Publishing. pp. 25–. ISBN 978-1-4629-1907-9. Tamara Thiessen (5 January 2016). Borneo. Bradt Travel Guides. pp. 57–. ISBN 978-1-84162-915-5. "Borneo birds". World Wide Fund for Nature. Retrieved 26 May 2017. ^ MacKinnon, K; et al. (1998). The Ecology of Kalimantan. London: Oxford University Press. ^ Li, C.; Corrigan, S.; Yang, L.; Straube, N.; Harris, M.; Hofreiter, M.; White, W.T. ; Naylor, G.J.P. (2015). "DNA capture reveals transoceanic gene flow in endangered river sharks". Proceedings of the National Academy of Sciences. 112 (43): 13302–13307. doi:10.1073/pnas.1508735112. PMC 4629339. PMID 26460025. ^ "Scientists discover new species in Heart of Borneo". World Wide Fund for Nature. 22 April 2010. Retrieved 26 May 2017. ^ a b "Borneo Lowland & Montane Forests – A Global Ecoregion". World Wide Fund for Nature. Archived from the original on 15 July 2017. Retrieved 26 May 2017. ^ Colby Loucks. "Southeastern Asia: Indonesia, Malaysia, and Brunei". World Wide Fund for Nature. Retrieved 26 May 2017. ^ "Sundaland heath forests". World Wide Fund for Nature. Retrieved 26 May 2017. ^ "Threats to Borneo forests". World Wide Fund for Nature. Archived from the original on 25 May 2016. Retrieved 26 May 2017. ^ Jonathan Kaiman (21 October 2015). "Fires in Southeast Asia may be emitting more greenhouse gases than the entire U.S." Los Angeles Times. Retrieved 27 May 2017. ^ Apichal Sunchindah (December 2015). "Transboundary Haze Pollution Problem in Southeast Asia: Reframing ASEAN's Response" (PDF). Economic Research Institute for ASEAN and East Asia. Retrieved 27 May 2017. ^ Aubert, M.; et al. (7 November 2018). "Palaeolithic cave art in Borneo". Nature. 564 (7735): 254–257. doi:10.1038/s41586-018-0679-9. PMID 30405242. ^ Cœdès, George (1968). The Indianized States of South-East Asia. University of Hawaii Press. ISBN 978-0-8248-0368-1. ^ Derek Heng Thiam Soon (June 2001). "The Trade in Lakawood Products Between South China and the Malay World from the Twelfth to Fifteenth Centuries AD". Journal of Southeast Asian Studies. 32 (2): 133–149. doi:10.1017/S0022463401000066. ^ a b Jan O. M. Broek (1962). "Place Names in 16th and 17th Century Borneo". Imago Mundi. 16: 129–148. doi:10.1080/03085696208592208. JSTOR 1150309. ^ (Chapter 15) The Earliest Indic State: Kutai. The Austronesians: Historical and Comparative Perspectives. E Press, The Australian National University. 2006. ISBN 9781920942854. Retrieved 1 October 2009. ^ Peter SkalnÃk (1 January 1989). Outwitting the State. Transaction Publishers. pp. 41–. ISBN 978-1-4128-3041-6. ^ Ooi Keat Gin; Hoang Anh Tuan (8 October 2015). Early Modern Southeast Asia, 1350–1800. Routledge. pp. 90–. ISBN 978-1-317-55919-1. ^ Mohammad Al-Mahdi Tan Kho; Hurng-yu Chen (July 2014). "Malaysia-Philippines Territorial Dispute: The Sabah Case" (PDF). National Chengchi University. NCCU Institutional Repository. Archived from the original (PDF) on 9 May 2016. Retrieved 23 May 2016. ^ Mariah Doksil (25 August 2014). "Islam arrived in Sabah in 10th century". The Borneo Post. Archived from the original on 11 July 2016. Retrieved 11 July 2016. ^ "Islam In Indonesia. A resource of Islam in the archipelago". Archived from the original on 7 July 2017. Retrieved 1 May 2017. Frans Welman (1 August 2013). Borneo Trilogy Brunei: Vol 1. Booksmango. pp. 8–. ISBN 978-616-222-235-1. David Lea; Colette Milward (2001). A Political Chronology of South-East Asia and Oceania. Psychology Press. pp. 16–. ISBN 978-1-85743-117-9. Patricia Herbert; Anthony Crothers Milner (1989). South-East Asia: Languages and Literatures : a Select Guide. University of Hawaii Press. pp. 99–. ISBN 978-0-8248-1267-6. Nigel Hicks (2007). The Philippines. New Holland Publishers. pp. 34–. ISBN 978-1-84537-663-5. Peter Church (3 February 2012). A Short History of South-East Asia. John Wiley & Sons. pp. 16–. ISBN 978-1-118-35044-7. Harun Abdul Majid (15 August 2007). Rebellion in Brunei: The 1962 Revolt, Imperialism, Confrontation and Oil. I.B.Tauris. pp. 2 & 4. ISBN 978-1-84511-423-7. Eur (2002). The Far East and Australasia 2003. Psychology Press. pp. 203–. ISBN 978-1-85743-133-9. ^ K. S. Nathan; Mohammad Hashim Kamali (January 2005). Islam in Southeast Asia: Political, Social and Strategic Challenges for the 21st Century. Institute of Southeast Asian Studies. pp. 62–. ISBN 978-981-230-282-3. ^ Shinzō Hayase (2007). Mindanao Ethnohistory Beyond Nations: Maguindanao, Sangir, and Bagobo Societies in East Maritime Southeast Asia. University of Hawaii Press. ISBN 978-971-550-511-6. Eko Prayitno Joko. "Isu Pemilikan Wilayah Pantai Timur Sabah: Satu Penulusuran daripada Sumber Sejarah" (PDF) (in Malay and English). Universiti Malaysia Sabah. Archived from the original (PDF) on 19 May 2016. Retrieved 23 May 2017. Rozan Yunos (7 March 2013). "Sabah and the Sulu claims". The Brunei Times. Archived from the original on 17 June 2014. Retrieved 23 May 2017. ^ a b Bachamiya Abdul Hussainmiya (2006). Brunei: revival of 1906 : a popular history. Brunei Press. ISBN 978-99917-32-15-2. ^ Keat Gin Ooi (2004). Southeast Asia: A Historical Encyclopedia, from Angkor Wat to East Timor. ABC-CLIO. pp. 271–. ISBN 978-1-57607-770-2. ^ Eric Tagliacozzo; Wen-chin Chang (13 April 2011). Chinese Circulations: Capital, Commodities, and Networks in Southeast Asia. Duke University Press. pp. 236–. ISBN 978-0-8223-4903-7. ^ Ranjit Singh (2000). 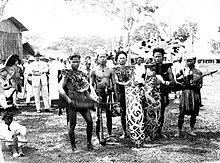 The Making of Sabah, 1865–1941: The Dynamics of Indigenous Society. University of Malaya Press. ISBN 978-983-100-095-3. ^ a b Donald F. Lach (16 April 1994). Asia in the Making of Europe, Volume I: The Century of Discovery. University of Chicago Press. pp. 580–. ISBN 978-0-226-46732-0. ^ P. M. Holt; Peter Malcolm Holt; Ann K. S. Lambton; Bernard Lewis (21 April 1977). The Cambridge History of Islam: Volume 2A, The Indian Sub-Continent, South-East Asia, Africa and the Muslim West. Cambridge University Press. pp. 129–. ISBN 978-0-521-29137-8. ^ The Asiatic Journal and Monthly Register for British and Foreign India, China, and Australia. Parbury, Allen, and Company. 1816. pp. 561–. ^ a b Sanderson Beck (2007). "Indonesia and the Dutch 1800–1950". San.Beck. Archived from the original on 24 May 2017. Retrieved 24 May 2017. ^ a b Adrienne Smith (2012). "British and Dutch Perceptions of Cannibalism in Borneo, 1882–1964" (PDF). California Polytechnic State University. p. 5. Retrieved 24 May 2017. ^ CAPTAIN THE HON. HENRY KEPPEL, R.N. (1846). THE EXPEDITION TO BORNEO OF H.M.S. DIDO FOR THE SUPPRESSION OF PIRACY. pp. 214–. ^ P. Boomgaard (January 2007). A World of Water: Rain, Rivers and Seas in Southeast Asian Histories. KITLV Press. pp. 141–. ISBN 978-90-6718-294-2. ^ H. Wilfrid Walker. "Wanderings Among South Sea Savages And in Borneo and the Philippines". Full Books. pp. 3/3. Archived from the original on 4 November 2009. Retrieved 23 May 2017. ^ Harriette McDougall (1882). "Sketches of Our Life at Sarawak (Chapter XVI. Illanun Pirates)". Society for Promoting Christian Knowledge; E. & J. B. Young. London, New York: Project Canterbury, Anglican History. Retrieved 23 May 2017. ^ Robert Cribb (1 February 2013). Historical Atlas of Indonesia. Routledge. pp. 129–. ISBN 978-1-136-78057-8. ^ J. R. V. Prescott (3 October 2014). Political Frontiers and Boundaries (Routledge Library Editions: Political Geography). Routledge. pp. 288–. ISBN 978-1-317-60199-9. ^ "Part 2 – The Brooke Era". The Borneo Project. Earth Island Institute. Archived from the original on 24 May 2013. Retrieved 11 November 2012. ^ Rozan Yunos (7 September 2008). "Loss of Labuan, a former Brunei island". The Brunei Times. Archived from the original on 28 April 2014. Retrieved 23 May 2017. ^ "British North Borneo Papers". School of Oriental and African Studies. Archives hub. Retrieved 23 May 2017. ^ Jatswan S. Sidhu (20 December 2016). Historical Dictionary of Brunei Darussalam. Rowman & Littlefield Publishers. pp. 51–. ISBN 978-1-4422-6459-5. ^ "Treaty of Protection 1888 – Brunei". Muslim Museum Initiative. Retrieved 23 May 2017. ^ Richard Ker (26 August 2012). "Ellena – America's Lost Colony in Kimanis of North Borneo". North Borneo Historical Society. Archived from the original on 21 May 2017. Retrieved 23 May 2017. ^ James W. Gould (1969). The United States and Malaysia. Harvard University Press. pp. 63–. ISBN 978-0-674-92615-8. ^ K. G. Tregonning (November 1954). "American Activity in North Borneo, 1865–1881". Pacific Historical Review. 23 (4): 357–372. doi:10.2307/3634654. JSTOR 3634654. ^ James Francis Warren (1981). The Sulu Zone, 1768-1898: The Dynamics of External Trade, Slavery, and Ethnicity in the Transformation of a Southeast Asian Maritime State. NUS Press. pp. 114–. ISBN 978-9971-69-004-5. ^ Emrys Chew (12 June 2012). Arming the Periphery: The Arms Trade in the Indian Ocean During the Age of Global Empire. Palgrave Macmillan. pp. 205–. ISBN 978-0-230-35485-2. ^ British Government (1885). "British North Borneo Treaties. 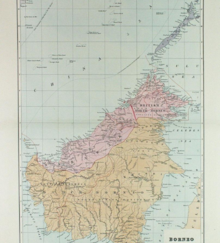 (British North Borneo, 1885)" (PDF). Sabah State Government (State Attorney-General's Chambers). Retrieved 23 May 2017. ^ Paul J. Carnegie; Victor T. King; Zawawi Ibrahim (21 September 2016). Human Insecurities in Southeast Asia. Springer. pp. 74–. ISBN 978-981-10-2245-6. ^ Dr. Johnstone; A. J. West (Officers of the Company) (3 February 1898). "North Borneo Chartered Company: North Borneo Railway; The first train in North Borneo". British North Borneo Chartered Company: Views of British North Borneo, Printed by W. Brown & co., limited, London, 1899. Malayan Railways. Retrieved 23 May 2017. ^ Rob Dickinson. "The North Borneo Railway Project". The International Steam Pages. Archived from the original on 28 March 2013. Retrieved 23 May 2017. ^ Danny Wong Tze Ken (1999). "Chinese Migration to Sabah Before the Second World War". Archipel. 58 (3): 131–158. doi:10.3406/arch.1999.3538. ^ Geert Oostindie (1 January 2008). Dutch Colonialism, Migration and Cultural Heritage: Past and Present. BRILL. pp. 292–. ISBN 978-90-04-25388-9. ^ a b Victor Prescott; Gillian D. Triggs (25 June 2008). International Frontiers and Boundaries: Law, Politics and Geography. BRILL. pp. 380–. ISBN 978-90-474-3364-4. ^ "Anglo-Dutch Treaty of 1824 – Malaysia and Indonesia". Muslim Museum Initiative. Retrieved 23 May 2017. ^ Takashi Shiraishi (January 1993). The Japanese in Colonial Southeast Asia. SEAP Publications. pp. 54–. ISBN 978-0-87727-402-5. ^ a b Regina Lim (2008). Federal-state Relations in Sabah, Malaysia: The Berjaya Administration, 1976–85. Institute of Southeast Asian Studies. pp. 36–84. ISBN 978-981-230-812-2. ^ Danny Tze-Ken Wong (1998). The Transformation of an Immigrant Society: A Study of the Chinese of Sabah. Asean Academic. ISBN 978-1-901919-16-5. ^ Malcolm Joseph Thurman; Christine Sherman (2001). War Crimes: Japan's World War II Atrocities. Turner Publishing Company. pp. 123–. ISBN 978-1-56311-728-2. M.C. Ricklefs (11 September 2008). A History of Modern Indonesia Since C.1200. Palgrave Macmillan. pp. 239–. ISBN 978-1-137-05201-8. Yew-Foong Hui (9 September 2011). Strangers at Home: History and Subjectivity among the Chinese Communities of West Kalimantan, Indonesia. BRILL. pp. 43–. ISBN 978-90-474-2686-8. Taufiq Tanasaldy (2012). Regime Change and Ethnic Politics in Indonesia: Dayak Politics of West Kalimantan. BRILL. pp. 74–. ISBN 978-90-04-25348-3. ^ Syafaruddin Usman Mhd; Isnawita Din (2009). Peristiwa Mandor berdarah (in Indonesian). Media Pressindo. pp. 137–. ISBN 978-979-788-109-2. ^ Muhammad Abdul Aziz (6 December 2012). Japan's Colonialism and Indonesia. Springer Science & Business Media. pp. 214–. ISBN 978-94-011-9233-0. ^ a b c d Milton W. Meyer (1 January 2000). Asia: A Concise History. Rowman & Littlefield Publishers. pp. 305–. ISBN 978-0-585-11423-1. ^ Philip Towle; Margaret Kosuge; Yoichi Kibata (2000). Japanese Prisoners of War. A&C Black. pp. 47–. ISBN 978-1-85285-192-7. ^ Judith M. Heimann (9 November 2007). "Guests can succeed where occupiers fail". International Herald Tribune. Archived from the original on 21 June 2008. Retrieved 26 May 2017. ^ A. B. Feuer (November 2005). Australian Commandos: Their Secret War Against the Japanese in World War II. Stackpole Books. pp. 27–. ISBN 978-0-8117-3294-9. ^ Richard Ker (7 November 2013). "Brief History on How the Australians Liberated North Borneo during WWII [Video]". North Borneo Historical Society. Archived from the original on 23 May 2017. Retrieved 23 May 2017. 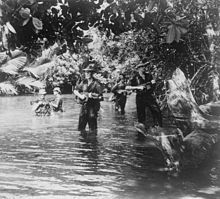 ^ "Australian invasion of Borneo in pictures". Malayan Railways. Retrieved 23 May 2017. ^ a b Mary F. Somers Heidhues (2003). Golddiggers, Farmers, and Traders in the "Chinese Districts" of West Kalimantan, Indonesia. SEAP Publications. pp. 211–. ISBN 978-0-87727-733-0. ^ Nicholas Tarling (2001). A Sudden Rampage: The Japanese Occupation of Southeast Asia, 1941–1945. C. Hurst & Co. Publishers. pp. 192–. ISBN 978-1-85065-584-8. ^ Adrian Vickers (3 November 2005). A History of Modern Indonesia. Cambridge University Press. pp. 150–. ISBN 978-1-139-44761-4. ^ Karl DeRouen, Jr.; Uk Heo (10 May 2007). Civil Wars of the World: Major Conflicts Since World War II. ABC-CLIO. pp. 431–. ISBN 978-1-85109-919-1. ^ Bosheng Chen; Leong Sze Lee (2012). A Retrospect on the Dust-laden History: The Past and Present of Tekong Island in Singapore. World Scientific. pp. 66–. ISBN 978-981-4365-96-3. ^ United States. Dept. of State. International Information Administration. Documentary Studies Section; United States Information Agency. Special Materials Section; United States. International Communication Agency (1964). Problems of Communism. Special Materials Section, United States Information Agency. ^ Ramses Amer (23 May 2016). Conflict Management and Dispute Settlement in East Asia. Routledge. pp. 52–. ISBN 978-1-317-16216-2. ^ Christopher Tuck (23 May 2016). Confrontation, Strategy and War Termination: Britain's Conflict with Indonesia. Routledge. pp. 208–. ISBN 978-1-317-16210-0. ^ "Aggression Must be Deterred". The Age. 7 September 1964. Retrieved 23 May 2017. ^ "Confrontation in Borneo". NZ History. Government of New Zealand. Retrieved 23 May 2017. ^ "I. North Borneo Claim (Excerpt from President Diosdado Macapagal's State-of-the-Nation Message to the Congress of the Philippines)". Philippine Claim to North Borneo (Sabah), Vol. II. Government of the Philippines. 28 January 1963. Retrieved 23 May 2017. 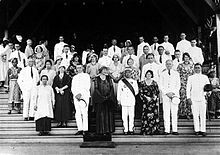 ^ "Cession and transfer of the territory of North Borneo by His Highness, Sultan Mohammad Esmail Kiram, Sultan of Sulu, acting with the consent and approval of the Ruma Bechara, in council assembled, to the Republic of the Philippines". Government of the Philippines. 24 April 1962. Archived from the original on 7 February 2016. Retrieved 23 May 2017. ^ Mohd. Jamil Al-Sufri (Pehin Orang Kaya Amar Diraja Dato Seri Utama Haji Awang. ); Mohd. Amin Hassan (1998). Brunei Darussalam: The Road to Independence. Brunei History Centre, Ministry of Culture, Youth, and Sports. ^ Alexander Nicholas Shaw (19 June 2016). "British counterinsurgency in Brunei and Sarawak, 1962–1963: developing best practices in the shadow of Malaya" (PDF). Small Wars & Insurgencies. 27 (4): 702–725. doi:10.1080/09592318.2016.1190052. ^ Karl Hack (2001). Defence and Decolonisation in Southeast Asia: Britain, Malaya and Singapore, 1941–1968. Psychology Press. pp. 278–. ISBN 978-0-7007-1303-5. ^ "Report of the Commission of Enquiry, North Borneo and Sarawak, 1962 (Cobbold Commission)". The National Archives. January – December 1962. Retrieved 25 May 2017. ^ Patricia Hului (16 September 2014). "THE COBBOLD COMMISSION: Giving people a voice". The Borneo Post. Archived from the original on 25 May 2017. Retrieved 25 May 2017. ^ Great Britain. Colonial Office; Malaysia; Great Britain. Office of Commonwealth Relations (1963). Malaysia: agreement concluded between the United Kingdom of Great Britain and Northern Ireland, the Federation of Malaya, North Borneo, Sarawak and Singapore. H. M. Stationery Office. ^ "Marcos order: Destabilize, take Sabah". Philippine Daily Inquirer. 2 April 2000. Retrieved 25 May 2017. ^ Paul F. Whitman (2002). "The Corregidor Massacre - 1968". Corregidor Historic Society. Archived from the original on 13 September 2015. Retrieved 5 June 2017. ^ Rommel Banlaoi (13 October 2009). Philippine Security in the Age of Terror: National, Regional, and Global Challenges in the Post-9/11 World. CRC Press. pp. 49–. ISBN 978-1-4398-1551-9. ^ Christine Padoch; Nancy Lee Peluso (1996). Borneo in Transition: People, Forests, Conservation, and Development. Oxford University Press. ISBN 978-967-65-3110-0. ^ Wing (2 August 2006). "Province of West Kalimantan, Indonesia". Guangdong Foreign Affairs Office. Archived from the original on 7 July 2009. Retrieved 23 May 2017. ^ "The world's successful diasporas (Overseas Chinese)". Management Today. 3 April 2007. Retrieved 23 May 2017. Shanti Nair (11 January 2013). Islam in Malaysian Foreign Policy. Routledge. pp. 67–. ISBN 978-1-134-96099-6. Nigel (16 August 2013). "Mustapha Bertanggungjawab Ubah Demografi Sabah". Sabah State Government (in Malay). Kudat Town Board. Archived from the original on 1 June 2016. Retrieved 23 May 2017. Ruben Sario (19 September 2013). "'Secret' taskforce entrusted from 1970s with issuing ICs to Sabah immigrants, Anwar tells RCI". The Star. Archived from the original on 1 June 2016. Retrieved 23 May 2017. ^ "Illegal immigrants causing simmering resentment in Sabah". The Malaysian Times. 22 August 2012. Archived from the original on 29 June 2014. Retrieved 23 May 2017. ^ "Indonesia flashpoints:, Kalimantan". BBC. 28 June 2004. Retrieved 13 August 2008. ^ "Beheading: A Dayak ritual". BBC. 23 February 2001. Retrieved 13 August 2008. ^ "Sensus Penduduk" (PDF) (in Indonesian). Badan Pusat Statistik, Indonesia. 2010. Archived from the original (PDF) on 12 October 2012. Retrieved 24 April 2014. ^ "Administrative Division Indonesia: Provinces, Regencies and Cities – Statistics & Maps by "City Population"". citypopulation.de. Retrieved 24 April 2014. ^ "Population Distribution and Basic Demographic Characteristics" (PDF). Department of Statistics, Malaysia. 2010. Archived from the original (PDF) on 11 October 2012. Retrieved 19 April 2012. ^ "Malaysia: Federal States, Territories, Major Cities & Conurbations – Statistics & Maps on City Population". Citypopulation.de. Retrieved 25 July 2011. ^ "Indonesia (Urban Municipality Population): Provinces, Cities & Municipalities – Statistics & Maps on City Population". Citypopulation.de. Retrieved 25 July 2011. ^ "Brunei: Districts, Major Cities, Towns & Agglomeration – Statistics & Maps on City Population". Citypopulation.de. Retrieved 25 July 2011. ^ a b c "Borneo » City Info » Economy". Borneo.com. Archived from the original on 27 May 2017. Retrieved 28 May 2017. Redmond O'Hanlon (1984). Into the Heart of Borneo: An Account of a Journey Made in 1983 to the Mountains of Batu Tiban with James Fenton. Salamander Press. ISBN 978-0-9075-4055-7. Eric Hansen (1988). Stranger in the Forest: On Foot Across Borneo. Century. ISBN 978-0-7126-1158-9. Gordon Barclay Corbet; John Edwards Hill (1992). The mammals of the Indomalayan Region: a systematic review. Oxford University Press. ISBN 978-0-19-854693-1. Robert Young Pelton (1995). Fielding's Borneo. Fielding Worldwide. ISBN 978-1-5695-2026-0. Ghazally Ismail (1996–2001). A Scientific Journey Through Borneo. Kota Samarahan: Universiti Malaysia Sarawak. K. M. Wong; Chew Lun Chan (1997). Mount Kinabalu: Borneo's Magic Mountain: An Introduction to the Natural History of One of the World's Great Natural Monuments. Kota Kinabalu: Natural History Publications. ISBN 978-983-812-014-2. Dennis Lau (1999). Borneo: a photographic journey. Travelcom Asia. ISBN 978-983-99431-1-5. John Wassner (2001). Espresso with the Headhunters: A Journey Through the Jungles of Borneo. Summersdale. ISBN 978-1-84024-137-2. Stephen Holley (2004). A White Headhunter in Borneo. Kota Kinabalu: Natural History Publications. ISBN 978-983-812-081-4. Wild Borneo: The Wildlife and Scenery of Sabah, Sarawak, Brunei, and Kalimantan. New Holland Publishers. 2006. ISBN 978-1-84537-378-8. Anton Willem Nieuwenhuis (2009). Quer durch Borneo (in Dutch). BoD – Books on Demand. ISBN 978-3-86195-028-8. G. W. H. Davison (2010). A Photographic Guide to Birds of Borneo: Sabah, Sarawak, Brunei and Kalimantan. New Holland. ISBN 978-1-84773-828-8. Charles M. Francis (2013). A Photographic Guide to Mammals of South-East Asia. Bloomsbury Publishing Plc. ISBN 978-1-84773-531-7.